As a Salesforce.com user, the most fundamental thing your company does every day is answer the phone and place outbound calls to prospects. It’s 2013, and you’re still paying people to dial and type? Salesforce and your phone system could be doing a lot more heavy lifting for you. Vocalnet’s cloud is bolted directly to the Salesforce cloud, and when you make or receive calls, call information shows up in Salesforce and can be instantly logged into that prospect’s record. 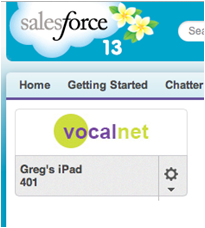 You can use your desk phone, or maybe an iPad or an Android phone, over 4G – it all just works on Vocalnet. Green phone icons will appear next to all of your contact’s phone numbers in Salesforce, allowing you to dial and answer calls straight from Salesforce. Your phone rings. If you have any prior knowledge of this person or company, their Account, Contact, and Lead information pops right in front of you instantly – find out what you need to know, maybe before the second ring! If not, click on “Create New Account” and we’ll fill in part of their info to get you started. Every call is logged into Salesforce, so there is no longer a need to add notes and update each record. Vocalnet replaces business phone systems with IP-based telephones that connect through one of the best voice infrastructures in the world. Vocalnet is designed for businesses with between 5 and 500 phones, but we are connecting customers as large as 3,400 employees. Vocalnet delivers savings of 50% or more compared to traditional phone service, and we guarantee outstanding quality. StarrForce, in collaboration with Vocalnet, is helping companies discover how the disruptive innovation of Cloud Voice combined with tailored Salesforce implementations can fundamentally improve the way companies get their work done.